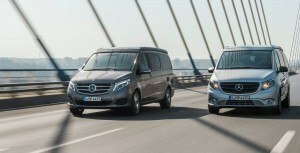 Mercedes-Benz globally has three core businesses: trucks/buses, vans and cars. 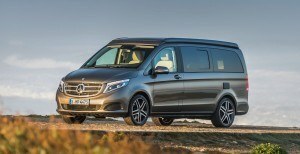 The US market has been almost exclusively focused on just one of these divisions, with the launch of the M-B Sprinter lineup 12 years ago one of the first times Americans have seen the three-pointed star on a truck of any kind. Everywhere else in the world, Mercedes logos bigger than your head are everywhere in cities, construction sites, farm tracts and anywhere in between. 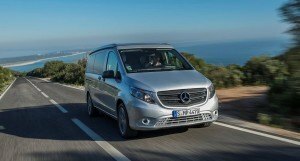 Part of the Mercedes-Benz USA focus on cars is now eroding — to the great benefit of shoppers able to buy some of the best trucks, buses and vans in the world. 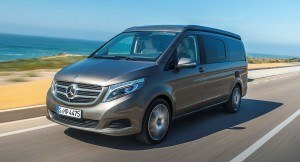 What started with Sprinter and Freightliner vans is now a thriving part of the Merc business in the US. Daimler trucks actually sold 500,000 units in the North American heavy-truck segments in 2014 with Freightliner, Western Star and Thomas Built Buses. 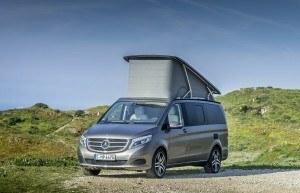 But still, the Mercedes brand is relatively sheltered from downmarket taint via unique showrooms for the MB Vans. 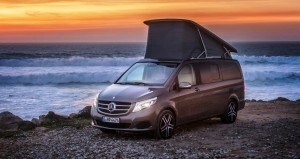 This presents a big opportunity for Mercedes. Leverage its brand values of tech and sophistication via an all-new sales channel exclusively for vans. 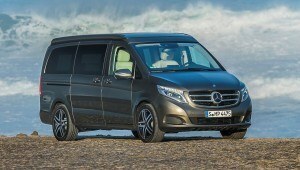 Sprinter is growing well with a new 4×4 option for 2015 — but where is the kid brother? 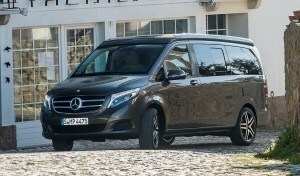 A new mid-size Mercedes-Benz van is coming to the US market in September of 2015 as a 2016 model-year — watch this space for the launch details of the $28k Metris. 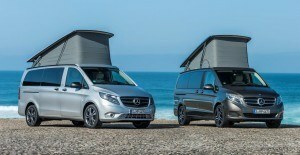 While the Marco Polo camper vans are not headed our way, they show the overall depth of the MB mid-size van offering. 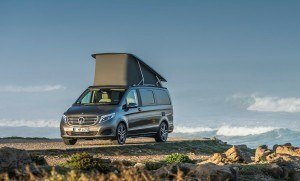 With the Marco Polo and Marco Polo ACTIVITY, Mercedes-Benz has succeeded in adding new highlights to the compact camper and recreational van segment. 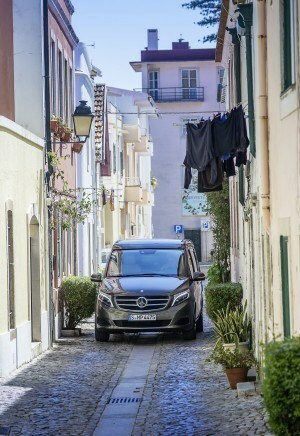 Both vehicles offer the dynamic performance, comfort and economy of a Mercedes-Benz passenger car – and are equally suitable for long journeys and for everyday use in urban environments. 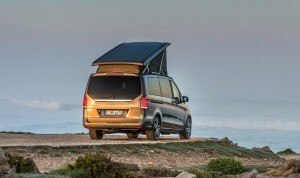 The compact Marco Polo camper van with fully equipped kitchen combines maximum functionality with supreme comfort and style. The interior offers a modern lounge with a host of ingenious details and excellent sleeping comfort for up to four people. Efficient driving pleasure comes courtesy of the cutting-edge four-cylinder turbodiesel engine in three power ratings and with a choice of rear-wheel or all-wheel drive. The compact Marco Polo ACTIVITY recreational vehicle boasts exceptional versatility. 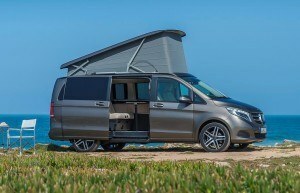 With a highly variable interior, comfortable sleeping facilities for up to five persons, five engine variants and three drive variants, it can be individualised as required. 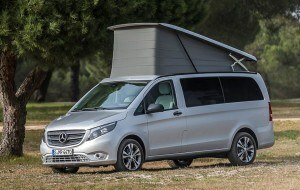 As such, it is the ideal vehicle the whole year round for young families as well as for sports and outdoor activity enthusiasts.The 4MATIC all-wheel drive broadens the scope of options for both vehicles to cater to personal mobility needs. The Marco Polo and the Marco Polo ACTIVITY combine leisure and daily use to perfection. The compact exterior dimensions, with a length of 5.14 metres and a width of 1.93 metres (excluding mirrors), combine with the electromechanical power steering to ensure great manoeuvrability and impressive agility. And with a height of 1.98 metres, both models are able to enter all normal garages, multi-level car parks, underground garages and car washes. 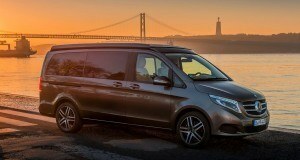 The same also goes for the 4MATIC models. The compact design of the all-wheel-drive system means that the vehicle’s overall height remains unchanged. 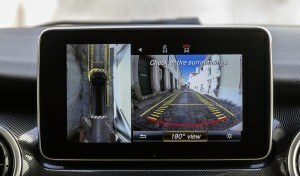 Numerous innovative driver assistance systems provide for exemplary safety. Both vehicles are equipped as standard with Crosswind Assist and ATTENTION ASSIST, which can warn of inattention and fatigue. 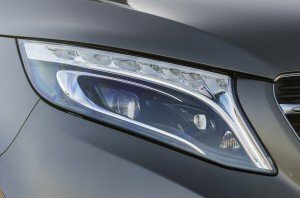 Optional features include Active Parking Assist, COLLISION PREVENTION ASSIST, Lane Keeping Assist and the LED Intelligent Light System. 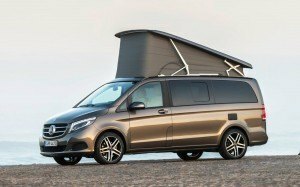 This is the first time that most of these assistance systems have been available in the compact camper van and recreational vehicle segment. 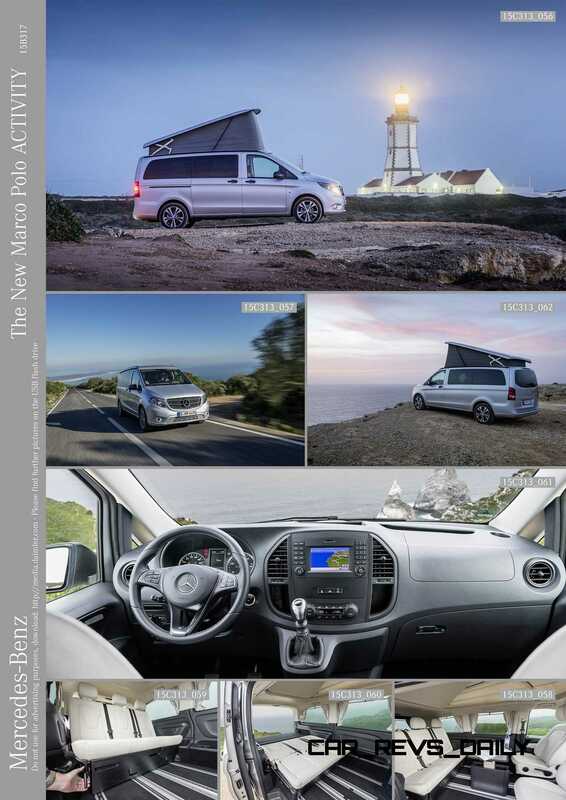 The Marco Polo blends impressive functionality with style, setting new standards in the segment. 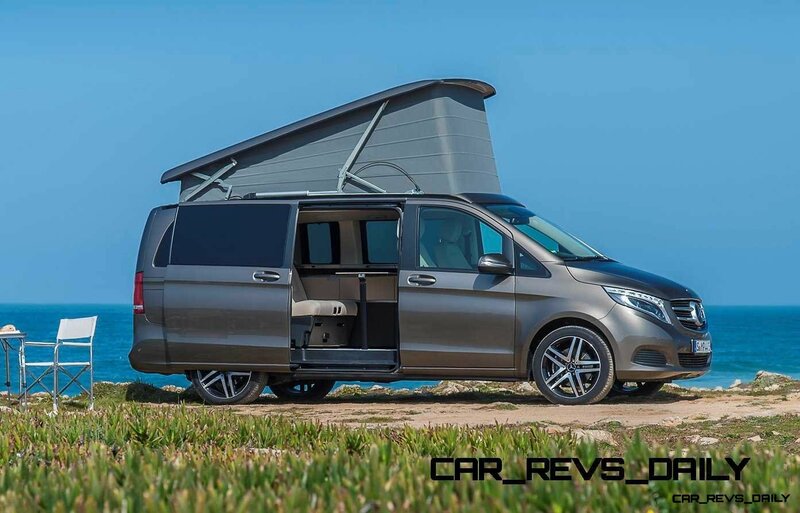 It offers a fully equipped kitchen, a wardrobe positioned on the left of the vehicle, a bench seat/bunk at the rear, swivelling front seats, a folding, sliding table and a roof bed. 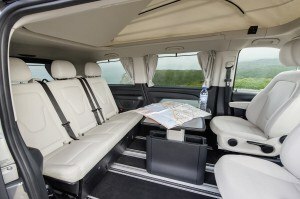 The interior has the air of an exclusive lounge from the cockpit through to the rear, with a finish featuring an elegant light/dark contrast. This modern interior design, flooring in yacht decking look as standard and atmospheric LED interior lighting including optional ambient lighting create an exceptionally high-class setting inside the vehicle and conjure up a home-from-home environment with a particularly spacious feel. The kitchen module has a remarkably innovative stowage system. It consists of one large and two smaller self-closing drawers and a large stowage compartment with a sliding door. The larger bottom drawer additionally features an extending worktop and offers ample space for storing kitchenware or supplies. The small drawers can also be opened when the bed is folded out. The covers for the sink, the gas cooker with two burners and the refrigerator can be raised separately. This means that areas which are not required can serve as useful surfaces on which items can be placed temporarily. They are produced in easy-care smoked safety glass, allowing light into the interior even when the covers are raised. The compressor refrigerator has a capacity of 40 l and a cooling capacity of up to minus 20 degrees Celsius. 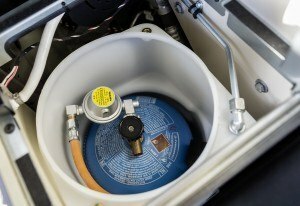 The fresh water tank has a capacity of 38 l, the waste water tank 40 l. Both tanks are therefore considerably larger than in the predecessor model. The folding table is attached to the kitchenette in a way that saves space, and can be slid flexibly in and out on a rail. 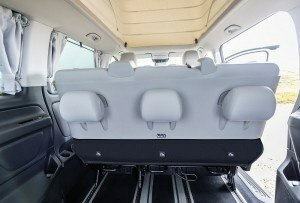 This means that it can be positioned ideally for up to four people – two on the luxury bench seat, one on the driver’s seat, which can be rotated by 140 degrees, and one on the front passenger seat, which can be turned a full 180 degrees. When folded, the table is locked in a vertical position next to the bench seat. 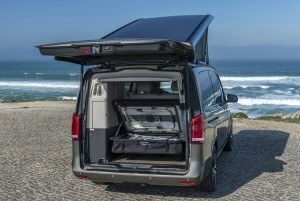 The rear section of the passenger compartment has a large wardrobe with sliding doors, a clothes rail and an illuminated swing-out mirror with stowage tray, which also lights up the wardrobe from the inside. The light goes on automatically as soon as the sliding doors are opened. 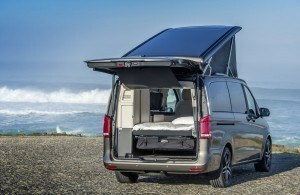 The Marco Polo offers additional stowage facilities in the form of an overhead stowage box above the rear bench seat and a roomy drawer under the two-seater bench, which can also be removed. 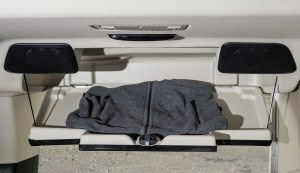 The luggage compartment can be enlarged in this way to accommodate larger objects. Anyone in need of even more stowage space can fit a carrier system on the roof. Two attachment rails integrated in the shell of the roof are suitable for various systems, such as ski racks, roof boxes or a Translift system, which facilitates loading of large items of sports equipment such as kayaks. The two-seater bench in the rear can be repositioned on rails, and provides excellent lateral support thanks to electropneumatically inflatable side bolsters. The backrest is divided into two, and can be individually electrically adjusted on each side. 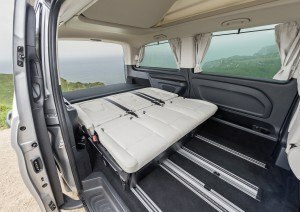 And if both backrests are folded down together, the bench seat can be converted into a double bed measuring 2.03 metres by 1.13 metres in a matter of seconds. The side bolsters are automatically deflated in the reclining position. 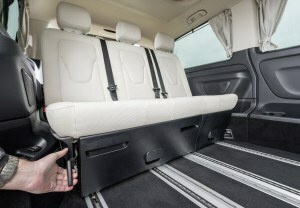 When folded out, the bench seat rises to conceal seat belt buckles that would otherwise disturb sleep. The bed extension can also be pivoted upwards to form a comfortable headrest. 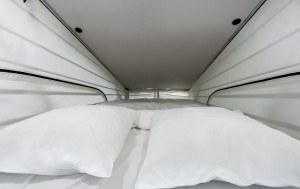 A second double bed which, like the bench seat, also ensured an outstanding night’s sleep in the predecessor model, can be found underneath the pop-up roof. Measuring 2.05 metres by 1.13 metres, the large luxury roof bed consists of a high-quality cold foam mattress and special spring elements with high point elasticity that allow an outstandingly ergonomic sleeping position right to the edges of the mattress. The pop-up roof in glass-fibre-reinforced plastic (GFRP) with a concertina of opaque, waterproof and breathable woven fabric has been further improved in comparison to the predecessor. 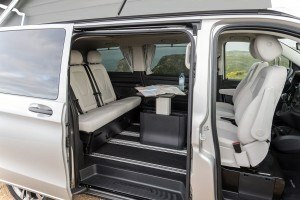 Thanks to an innovative scissor-action system, it has been possible to increase the pop-up height in the rear area considerably, creating particularly generous legroom. The way in which the woven fabric draws in has been improved to ensure that it collapses accurately in concertina-like fashion when the roof is lowered again. 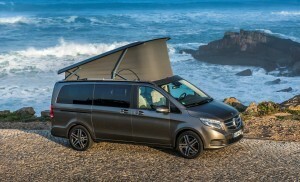 The pop-up roof is optionally available with an electric motor. 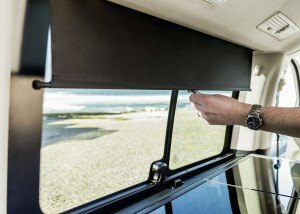 The black-tinted glass, which protects the interior from prying eyes and helps to prevent it from heating up in direct sunlight during the day, is another standard feature, as are the black-out roller blinds in the rear. To allow the interior to be darkened completely, a washable curtain is available for the windscreen and the front side windows. The vent window in the rear right corner of the rear compartment supplies fresh air for added comfort. 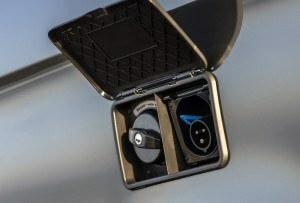 It can be opened and closed electrically as standard – one of the Marco Polo’s unique selling points. 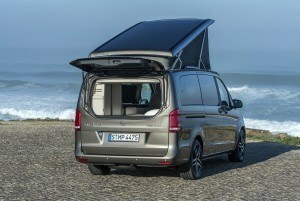 Another unique feature is the optional separately opening rear window. 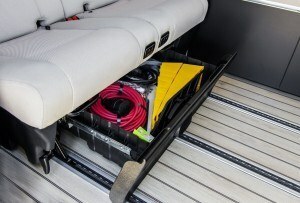 This makes it possible to use the second loading surface formed by the bed extension without opening the large tailgate. At the same time, as an additional window it also provides for an even better supply of fresh air and more effective ventilation of the interior. There is also the option of the EASY-PACK tailgate with power opening and closing that can also be stopped in any intermediate position. 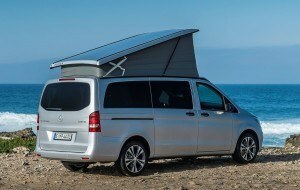 The Marco Polo also comes with two camping chairs and a table as standard for relaxing outdoors. They are conveniently stowed in a bag inside the luggage compartment under the bed extension. A pleasant shaded “terrace” surrounded by nature can be created by opting for the awning above the sliding door, which is now detachable – a first for this segment. It can be removed in the winterfor examle. The cockpit of the Marco Polo also takes comfort to a whole new level. 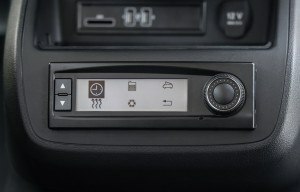 Highlights include the free-standing central display, the multifunction steering wheel with 12 buttons and DIRECT SELECT lever with steering-wheel shift paddles for automatic models, as well as the innovative touchpad, which allows all telematics functions to be operated in the same way as on a smartphone. 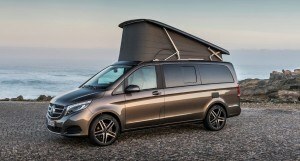 The Marco Polo also comes complete with the new “Mercedes-Benz Touch” app. 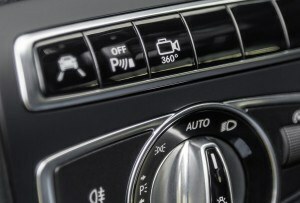 This enables the COMAND Online infotainment system to be controlled from any seat by smartphone. Together, the app and touchpad form the key to the most cutting-edge control and display concept in this vehicle class. 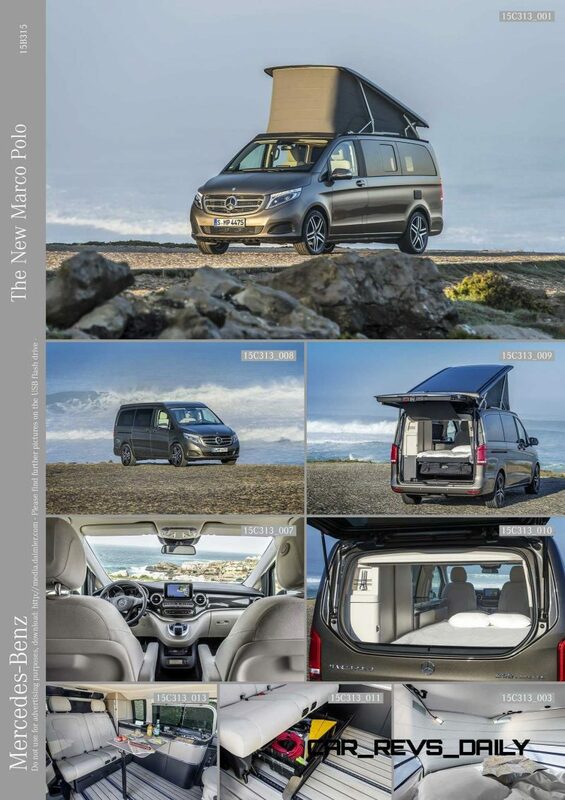 The new Marco Polo combines stylish living and travelling with the ride comfort and dynamics of a passenger car. The cutting-edge four-cylinder turbo diesel engine with two-stage turbocharging provides for efficient driving enjoyment in three output variants. 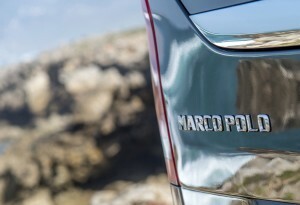 The Marco Polo 200 CDI generates 100 kW (136 hp) and peak torque of 330 Nm. 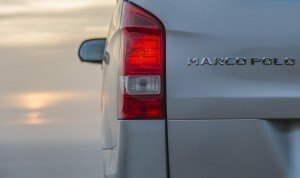 The Marco Polo 220 CDI is rated at 120 kW (163 hp) and 380 Nm. It offers segment-leading efficiency, with fuel consumption of only 6.0 litres per 100 km and CO2 emissions of 158 grams per kilometre. 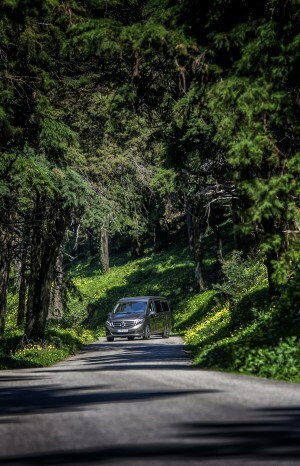 The top-of-the-range 140 kW (190 hp) engine in the Marco Polo 250 BlueTEC boasts a mighty 440 Nm of peak torque while still only burning a frugal 6.2 litres every 100 km. 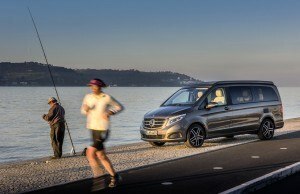 All three engine variants offer ideal traction on any surface in conjunction with 4MATIC permanent all-wheel drive.Power is split between the front and rear wheels in the ratio 45 to 55. 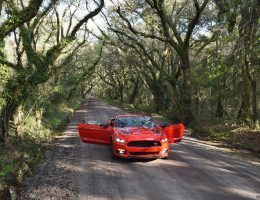 The all-wheel-drive system works entirely without mechanical differential locks. The Electronic Stability Program (ESP®) works in unison with the Electronic Traction System 4ETS to maximise traction. The instant one of the wheels on either axle loses grip, it is braked by the electronics with lightning speed. This allows the 4ETS to automatically direct the drive power to the wheels with greater traction without any additional mechanics. 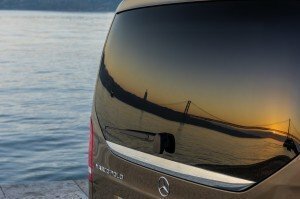 This technology, which is also deployed on many Mercedes-Benz SUVs and off-road vehicles, saves on weight and at the same time increases safety and comfort. 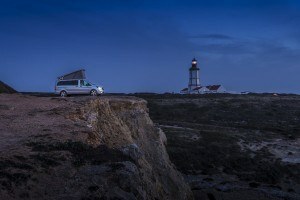 Other pioneering features in the compact camper van segment are the AGILITY SELECT switch with four transmission modes and the AGILITY CONTROL suspension with selective adjustment of the damping system to the given road surface conditions. 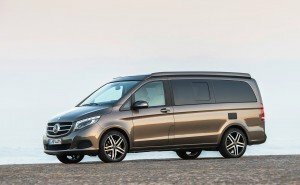 Despite the new design and new technologies, Mercedes-Benz continues to offer the attractive price positioning which was established by the predecessor model. 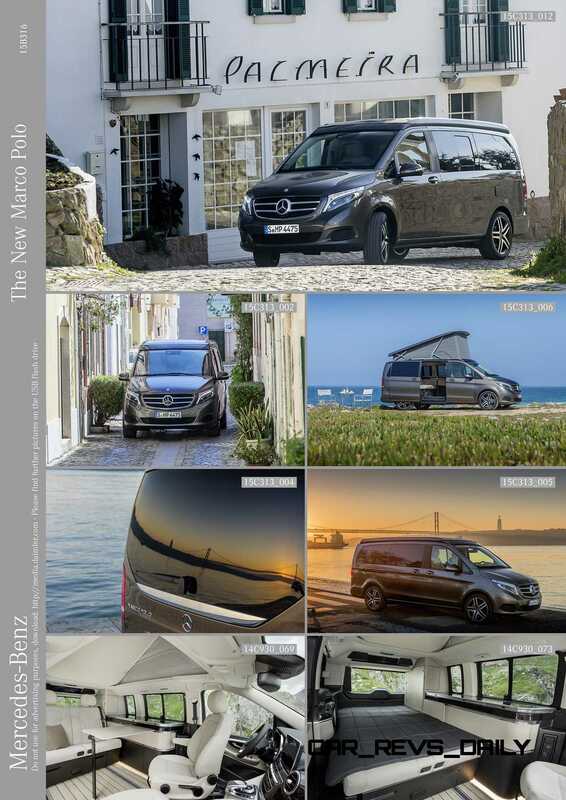 The new Marco Polo is available at prices starting from 54,835 euros (price in Germany incl. 19 percent VAT). 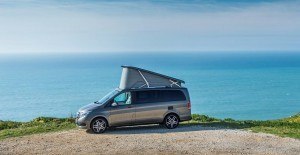 The Marco Polo ACTIVITY is equipped as standard with a three-passenger bench seat/bunk combination with one-piece backrest and bed extension. The bench can be slid forward on rails. 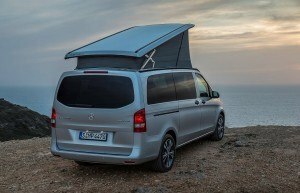 In this way, the capacity of the luggage compartment can be more than doubled in an instant to accommodate surfboards, paragliding equipment or even a bicycle inside the vehicle.Anyone who requires even more room, e.g. for carrying newly purchased shelf units, can also use the floor underneath the bed as load space. Under the bed are two drawers that can be removed, allowing items to be loaded through the resulting space. 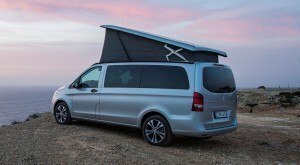 When spending the night in the vehicle, the bench seat easily converts into a comfortable bed measuring 1.93 metres by 1.35 metres for up to three people. 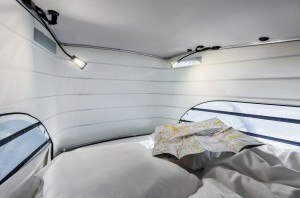 An additional sleeping facility for two people is offered by the roof bed under the pop-up roof on board the new Marco Polo. Featuring a cold foam mattress and special spring elements with high point elasticity, this bed offers a standard of lying comfort that is exceptional in the segment. 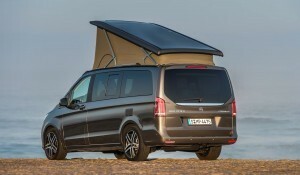 As in the Marco Polo, when the luxury roof bed is not in use it can be folded upwards at the front when the roof is raised. This provides plenty of headroom in the vehicle interior. 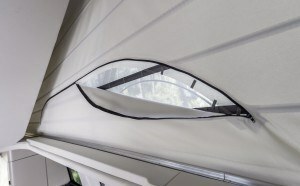 At the same time, the two side ventilation slits in the concertina direct even more fresh air into the interior. 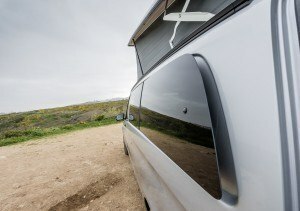 The two standard-fit vent windows in the rear provide for an added supply of pleasant fresh air. 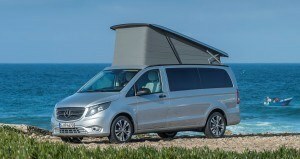 They can be opened and closed electrically – a unique selling point for the Marco Polo ACTIVITY in the compact recreational vehicle segment. Curtains in the rear also come as standard. To allow the interior to be darkened completely, an opaque and washable curtain is available for the windscreen and the front side windows. 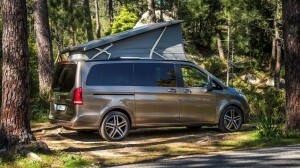 For spending pleasant hours outdoors shaded from the sun, the Marco Polo ACTIVITY offers the option of a pull-out awning above the sliding door which is also detachable – a first for this segment. This means that it does not have to be on board all year round and can be removed in the winter, for example, when it is no longer needed. 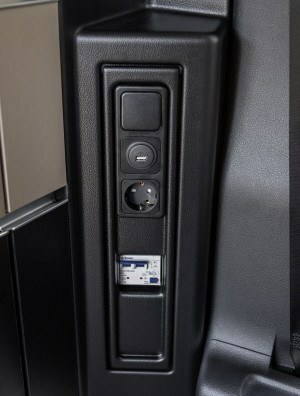 The Marco Polo ACTIVITY comes with the pre-installation for a radio as standard. 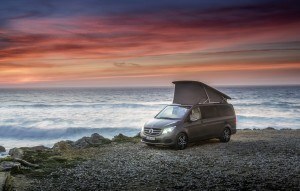 The Becker® MAP PILOT is also optionally available, as are the Mercedes-Benz Audio 10 and Audio 15 infotainment systems. The Audio 10 unit features a USB port for using mobile devices and an SD memory card slot, for example. It is compatible with the most diverse media formats. The Audio 15 additionally offers a high-resolution 14.7 cm display and an iPod® interface, and can be interconnected with the Becker® MAP PILOT navigation device. 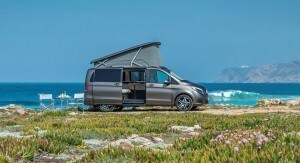 The new Marco Polo ACTIVITY also shows itself to be tremendously versatile when it comes to drive power: Customers are able to choose from four-cylinder diesel engines with five output ratings ranging from 65 kW up to 140 kW (88 hp to 190 hp). All the new engine variants stand out by virtue of their low fuel consumption and emissions. 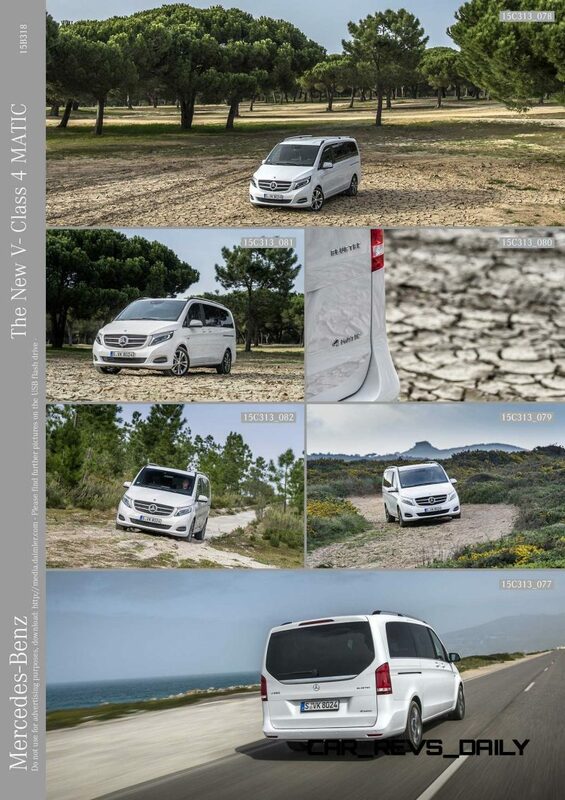 What’s more, three different drive configurations are on offer, with a choice of front-wheel, rear-wheel and all-wheel drive. 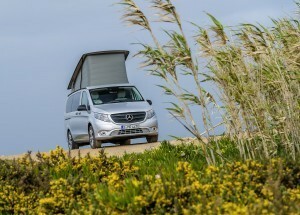 This means that the new Mercedes-Benz recreational vehicle offers an unrivalled level of diversity in its segment – for tailoring to your individual leisure needs. 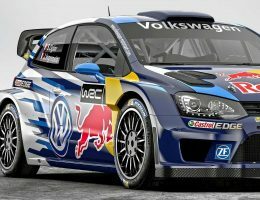 For the front-wheel drive, the new 1.6-litre four-cylinder unit with common-rail direct injection is available with 65 kW (88 hp) or 84 kW (115 hp). 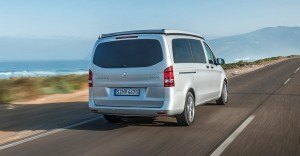 The turbodiesel engine makes its mark with superb power delivery and impressive smoothness combined with economical fuel consumption (as low as 6.4 l/100 km). Even greater performance is provided by the 2.1-litre four-cylinder diesel engine with two-stage turbocharging in conjunction with rear-wheel drive. This engine is available with an output of 100 kW (136 hp), 120 kW (163 hp) or 140 kW (190 hp). With average NEDC consumption as low as 5.8 litres per 100 km and CO2 emissions of just 152 grams per kilometre, the 120 kW Marco Polo ACTIVITY 220 CDI leads the way in its segment. 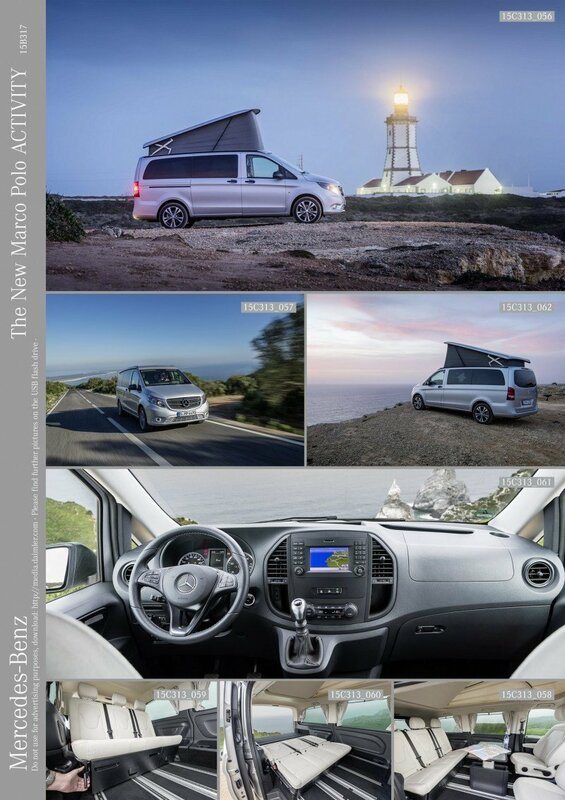 The top-of-the-range Marco Polo ACTIVITY 250 BlueTEC places 140 kW (190 hp) and 440 Nm of torque on tap while also consuming a mere 5.8 litres of fuel every 100 km. 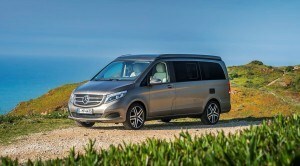 The all-wheel-drive system that is optionally available for all three models with rear-wheel drive (200 CDI 4MATIC, 220 CDI 4MATIC, 250 BlueTEC 4MATIC) delivers propulsive power of the highest order. In the transfer case the drive torque is directed to the axles by a central differential in a ratio of 45 to 55. The driving power is distributed by the well-proven 4ETS Electronic Traction System combined with the ESP® and ASR dynamic handling control systems. If one or more wheels lose grip, 4ETS brakes them individually and directs the driving power to the wheels with good traction in a matter of milliseconds. In this way, 4ETS achieves the effect of three differential locks. The all-wheel drive additionally facilitates moving off and acceleration, particularly on poor road surfaces or in unfavourable weather conditions. The engine power is transferred by the 7G-TRONIC PLUS automatic transmission with torque converter, which is linked with an ECO start/stop function. In this way, the Marco Polo ACTIVITY models 200 CDI 4MATIC, 220 CDI 4MATIC and 250 BlueTEC 4MATIC offer even greater flexibility and spontaneity for recreational purposes and in everyday use. 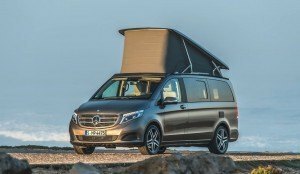 They are the comfortable all-rounders for all seasons and all terrains – from dense urban traffic through motorways to rough gravel roads, muddy dirt tracks, rain-soaked roads or snow-covered high alpine roads. The starting price for adventures with the Marco Polo ACTIVITY stands at 38,960 euros (price in Germany incl. 19 percent VAT. ).